Inspections involve visual checks combined with measurements and material surveys which are performed in order to assess the condition and safety level of a structure. All bridges and quays must be inspected at regular intervals, to determine the need for operational measures and/or maintenance, as well as to identify whether strengthening or modifications is needed. Major bridge inspections are generally performed every five years. When an inspection has been performed, a report is prepared which includes an assessment of the structure’s condition and recommendations for any measures needed. The visual major inspection could then result in a need for further material surveys. A special inspection could then be performed in order to learn more about the condition of the structure. The answers from the material surveys and further survey work could result in the need to perform maintenance work. At the start of the 1990s, Aas-Jakobsen made a strategic decision to focus on inspection and repair activities for bridges. The reason behind this decision was partly a motivation to future-proof our design skills, since it is operation and maintenance over many years which demonstrates how successful a design has been. Since the mid-1990s, we have had a high level of activity in performing inspections, as well as designing and preparing tender documents for repair, modification and strengthening work on bridges, and later also quays. The engineers who started this activity in the early 1990s are still active with annual inspections and have gained a great deal of experience, which they are passing on to others in the company. There are several people in the company who have more than 10 or 20 years of experience in this field. We have several inspection teams which we can use when required, and all of the inspection leaders have over 10 years of experience in inspecting and designing bridges. We have 2 FROSIO-certified inspectors who have special qualifications in the area of surface treatment of steel. We have also access to all the important inspection and measurement equipment for use in condition inspections. We have our own equipment for sampling and analysis work for the most common types of material sampling for concrete, steel and timber. 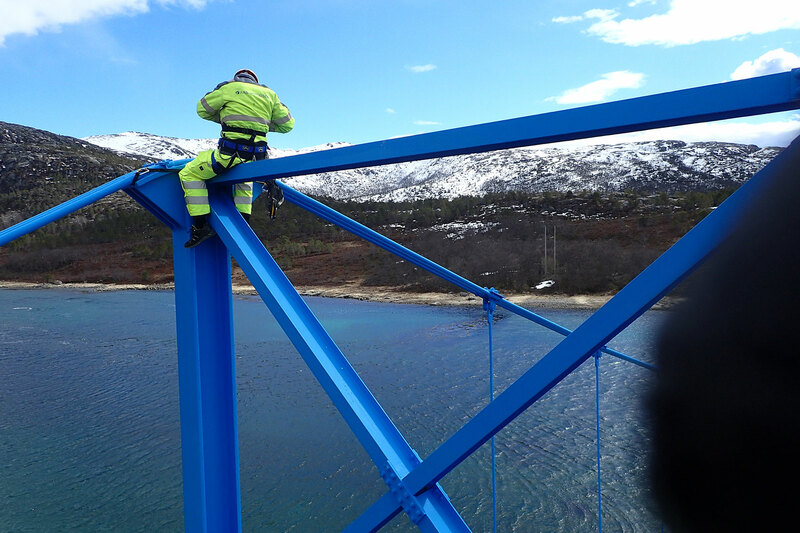 We perform inspections on buildings, quays, tunnels, offshore structures and bridges. We are one of only a few companies in the country who can offer safety and access equipment which is light and rope-based, and which in many instances makes heavier access equipment unnecessary. Our inspectors have climbing experience and are certified by AAK Industrisikring AS. 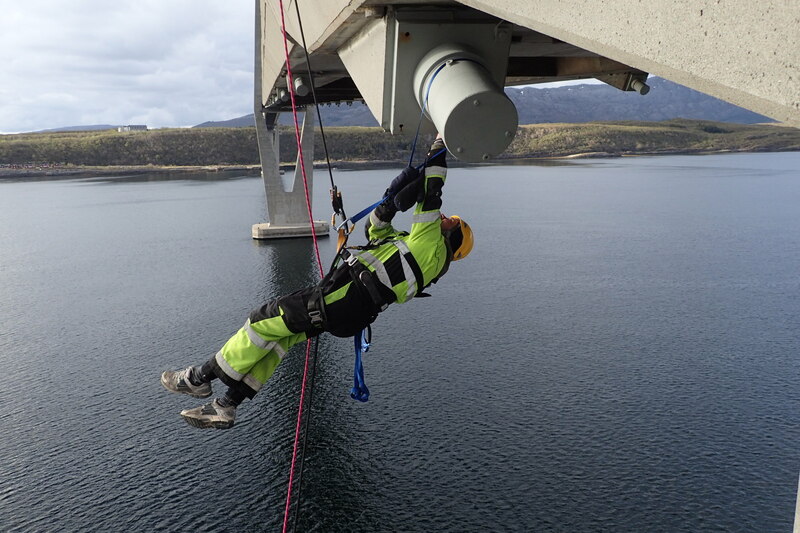 The rope-based safety equipment is portable and mobile, and is CE marked in accordance with the requirements of the Norwegian Labour Inspection Authority. Our safety methods have been designed to satisfy the requirements of the Working Environment Act and the EU, as well as the latest HSE requirements. 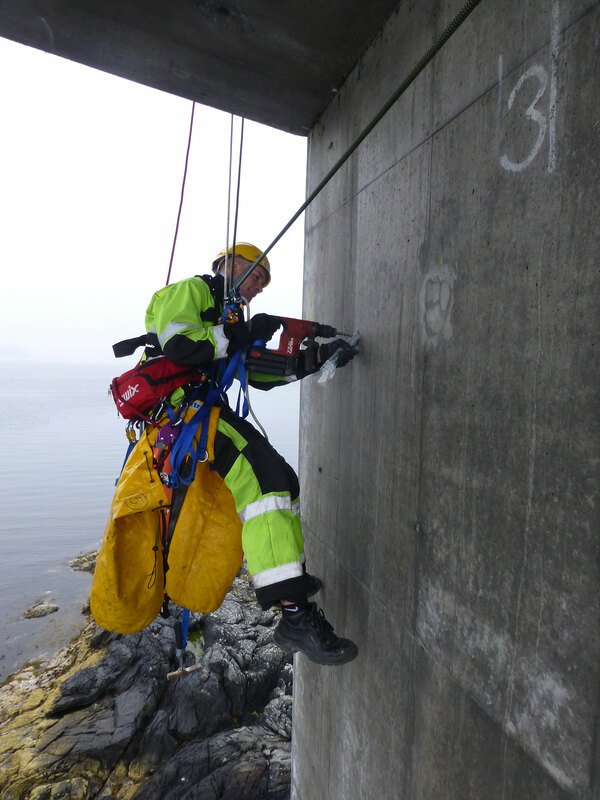 We also have good contacts with companies specialising in heavy access equipment and diving services. 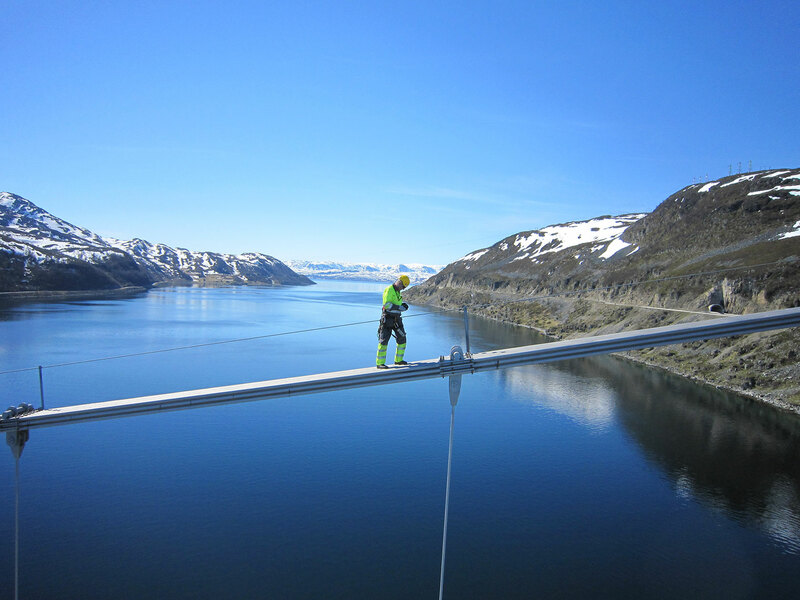 Ever since we started doing this, we have been kept busy with assignments to perform both major and special inspections of suspension bridges and cable-stayed bridges, since these are fields in which we have specialised. We also have specialist expertise in bascule bridges. We inspect any kind of bridge, and every year we perform inspections of between 100 and 300 bridges of varying size. Our main client is the Norwegian Public Roads Administration, but we also work for Sporveien, municipalities, individual Owners and Bane NOR. 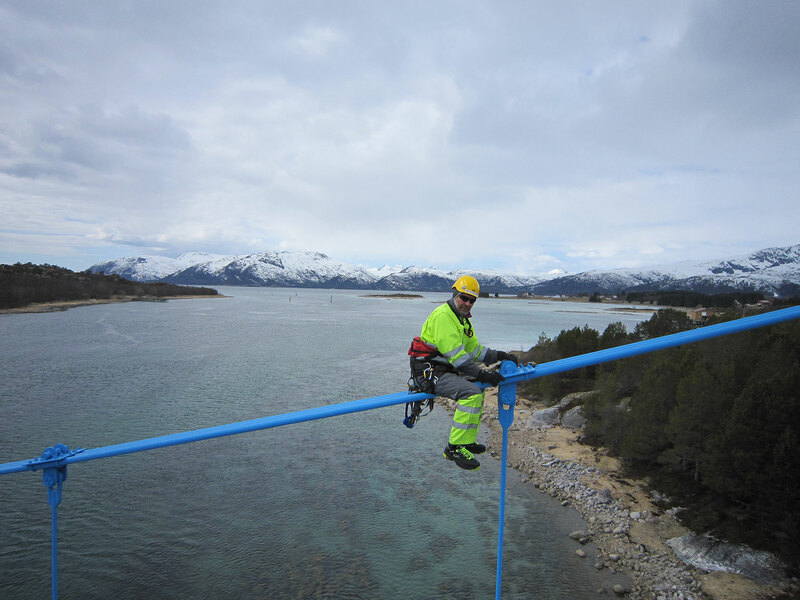 Aas-Jakobsen was the first company to use drones in bridge inspections reflected in our framework contract with the Norwegian Public Roads Administration back in 2015.